The QS-2770H is a feature-packed printer with an easy-to-read 12 digit display, automatic three digit punctuation, and an item counter display. Heavy duty, approximately 4.8 lines/sec. helps you get through even the toughest jobs quickly and easily. Our popular easy-touch keyboard is engineered for comfort and ease - helps reduce fatigue and increase productivity. Print 12 numerals, 2 symbols, and 3-digit punctuation in two colors (positive numbers in black, negative numbers in red). were designed for fast and comfortable operation. Extra ease is provided by contoured Plus/Equal and Minus/Equal keys. Frequently used Multiplication, Zero, and Plus/Equal keys are extra-large. 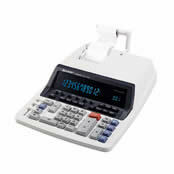 Add the grand total of several calculations such as the total prices times units on an invoice. MU (Multiple Use) key simplifies business calculations to save time and increase efficiency by handling functions like margin, markup, selling prices, costs, and percent changes. include independently accessible 4-key memory, date key, automatic first factor accumulation, average keys, item counter, 2-key rollover, double zero key, sign-change, and right-shift keys. This page is part of GeneralManual.Com Network SHARP QS-2770H Commercial Calculator User Manual.